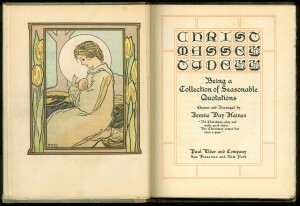 Jennie Day Haines authored six collections of quotations for Elder. She was born Jennie Elizabeth Day in New York on 26 May 1853 and was an honor student at the Normal College of New York in 1871. She married William Pitt Haines in 1873, and later lived in New Rochelle, New York and to Derby, Connecticut. 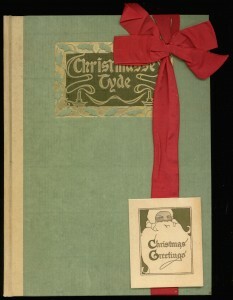 Frontispiece and title page of “Christmasse Tyde”. Artwork by Gordon Ross. The printer at the Tomoye Press was John Henry Nash. He was a master at the mitred rule: the straight line with the end cut at a 45° angle, so that perpendicular rules would fit together precisely. Look at the complicated gridwork of mitred rules on the title page: fitting the corners is the hardest part, and Nash made it look easy. 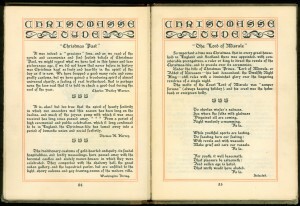 The weakest part of Christmasse Tyde is the typography. The text type is called Washington Text—ironic, because the typeface is only suitable as a display type. 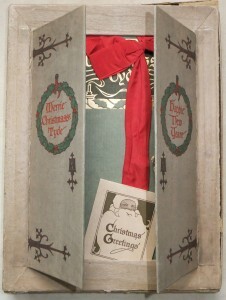 Paul Elder must have loved it, however, because it often appears in his publications during the first decade of the 1900s. I don’t know the name of the uncial typeface used in the title page and headers, but its readability is even worse than Washington Text. Still, Nash’s exacting rule grid make the page pleasant to look at. 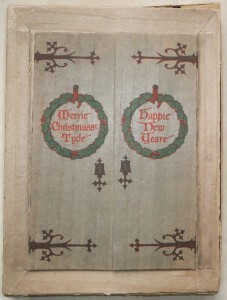 “Merrie Christmasse Tyde” and “Happie New Yeare” to all from paulelder.org. Previous post: What Is a Kindergarten?